This week is National Infrastructure Week, which focuses on the impact of infrastructure on the economy and society and how to make improvements for the 21st century. Cities across the country are experiencing heavy storms that lead to flooding—and all of its consequences. Additionally, the storms are becoming heavier and more frequent. A recent article in Chicago magazine imagines a future where Chicago leads the way in a country plagued by intensifying weather. The story dreams of highways made of a permeable material that lets water soak through and reduces flooding and large skyscrapers adorned with native plants that absorb water and then irrigate other plants. This vision is set in 2068, a mere half a century from now, but some of the innovations described are already happening. 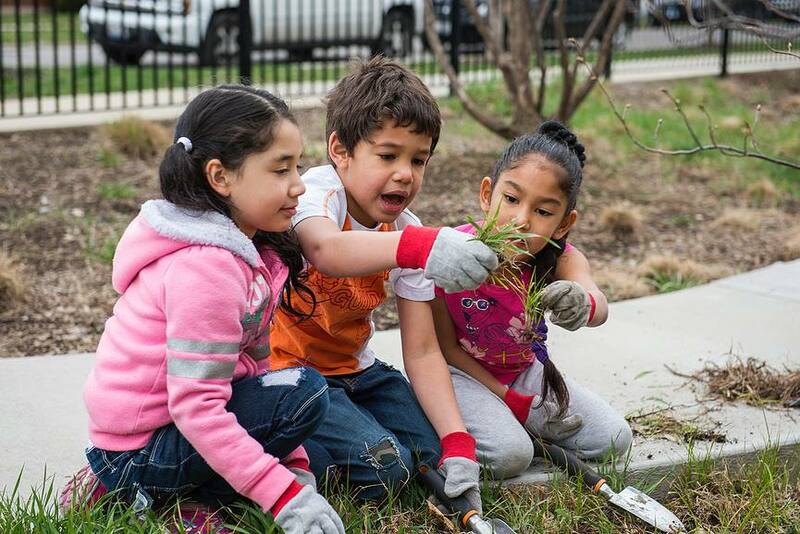 In schoolyards across Chicago, the Space to Grow program is transforming Chicago schoolyards into vibrant spaces that support children, communities and the environment. The program is co-managed by Healthy Schools Campaign and Openlands. Capital funding and expertise comes from Chicago Public Schools, the Metropolitan Water Reclamation District of Greater Chicago and the Chicago Department of Water Management. Each Space to Grow schoolyard receives a $1.5 million transformation, and every space uses special surfaces and design elements—such as rain gardens and permeable pavers—to capture rainwater and help reduce neighborhood flooding during the heaviest of storms. This innovative partnership ensures that the schoolyards are designed by and for the communities they serve. They become beautiful and functional spaces with many benefits for students, parents, schools and communities. Managing stormwater is especially important in Chicago because of the city’s combined sewer system. All of our used water and stormwater flow through the same pipes to a reclamation facility where the water is cleaned before being returned to the waterways. Treating all of the excess stormwater is costly, and the increased intensity of storms we experience puts additional burdens on treatment plants. The use of green infrastructure, which incorporates natural landscaping and permeable surfaces that mimic the natural water cycle, allows stormwater to slowly absorb into the ground right where it falls, keeping it out of the sewer system during peak storms. This not only protects our sewer system, but when used in schoolyards, also provides multiple community benefits. With more than 760 acres of impermeable surface in a highly urbanized area, Chicago Public Schools schoolyards present a significant opportunity for changing the way stormwater is managed on public land in Chicago. But the schoolyards also provide healthy, engaging places for students to be physically active before, during and after school. Each schoolyard includes spaces for physical activity, such as turf fields, jogging tracks, basketball and tennis courts, and play equipment for all ages. The schoolyards also include outdoor classrooms and native gardens, providing a daily opportunity to connect with nature which has proven benefits for academic achievement. Space to Grow schoolyards provide space and equipment that empower school leaders to put positive new CPS policies for recess and PE into practice. 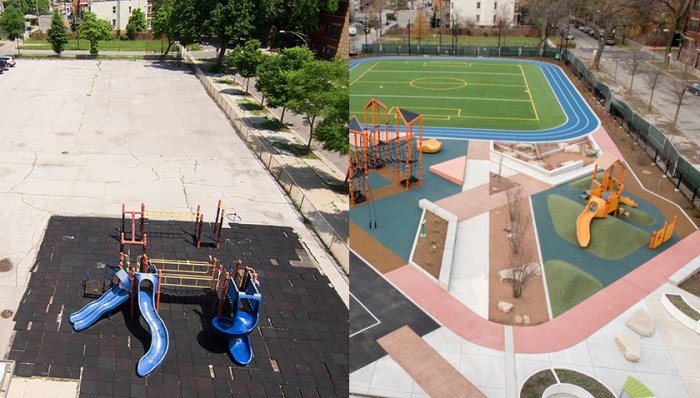 The schoolyards are also open to the community after school and on the weekends, serving a community parks in some of Chicago’s most park deficient communities. 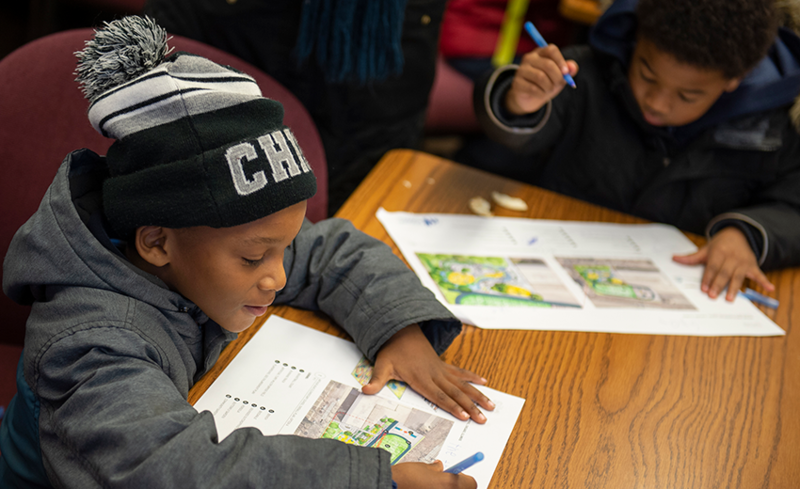 The Space to Grow partners’ current commitments will transform 34 schoolyards in Chicago. In total, those schoolyards will be able to capture and hold over 5 millions gallons of stormwater at any given time. They will serve over 15,000 Chicago Public School students and their families, providing access to nature, outdoor classrooms, space for physical activity and recreation and edible gardens to support nutrition education. To date, nine are completed and six will open this fall. We look forward to continuing this effort, improving one school at a time and one community at a time.